Upgrading your heating and cooling system to new high-efficiency ENERGY STAR units, can save you hundreds of dollars per year on your utility bills. Modern systems are far more energy-efficient than older models, so upgrading today can start paying dividends immediately! Not only will you benefit from a comfortable and evenly heating and cooled home, you’ll have more money in your pocket too! 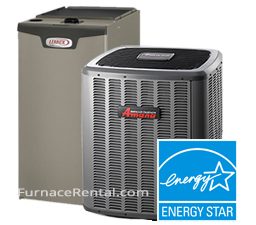 With a furnace rental, we take the guess work out of upgrading your HVAC system. We only use the best brands, popular choices for Canadians like Amana, Goodman. We also only work with licensed HVAC technicians to make sure that your system(s) are put in correctly for the health and safety of your family. By choosing a rental agreement, you are choosing the freedom to purchase a high-quality energy efficient heating or cooling system even if you don’t have thousands of dollars to buy the unit out right. We don’t require a down payment or a credit check. If you own your property, you are automatically approved. You are able to get a quality product installed at no additional cost to you by a professional certified technician. We even offer a free removal service for your old unit. In addition to free installation, we also offer protection that you won’t get with traditional financing. We offer free annual maintenance for the life of your agreement. Once a year a licensed technician will come to your home to make sure your system is working as efficiently as possible. That way you can continue to save on your energy bills as your system ages. We also offer free service calls. If your system fails you have access to our emergency line 24 hours a day, seven days a week. One phone call gets you expedited service. We will send a technician to fix your issue as soon as possible. If for any reason we cannot fix the issue, we will replace the unit, absolutely free. So what are you waiting for? There is no bigger investment than your home, why not make it as comfortable, affordable and energy efficient as possible? Call now 1-877-785-1055 for a two-minute quote and let us help you start saving you money. High-efficiency furnace and AC rentals make sense for Vancouverites! Arguably one of the best ways to see Vancouver is by spending the day exploring the “seawall” a 28 kilometer stretch of path that snakes along the waterfront. Mostly flat and easily accessible for all skill levels, this path takes you from the Vancouver Convention Center, through Stanley Park and through the English Bay. Along the route you will experience Science World, the Olympic Village, Granville Island and Kitsilano Beach. If heart pounding adventure is more your speed, visitors and residents can now experience a ‘surf up the mountain’ experience. The popular gondola ride up Grouse Mountain now has a new option for those who want an extra thrill. Instead of riding on the inside of the gondola car, guests now have the option to experience the view with the wind in their hair on the roof. This open-air experience is available during the summer months to those who want an exciting thrill. With so much natural beauty and adventure it’s no wonder so many people flock to British Columbia each year to visit and live. It’s also one of the reasons for its red hot real estate market. Those who are lucky enough to call Vancouver home know the importance of investing in their properties. More and more property owners are taking advantage of a high efficiency furnace or central air conditioning rental.